The number of adolescents with Crohn’s disease (CD) is rising, with one third of cases diagnosed before turning 21 years old. Evidence shows that long-term medical intervention, school absence and the physical toll of CD on the growing adolescent also have a psychological effect on patients. In addition, poorly defined transition pathways are extending these problems into adulthood. The National Institute for Health and Care Excellence (NICE) guidelines are important in shaping service delivery and distribution. However, analysis of the full 2012 NICE CD management guidelines indicates they fall short of providing adequate recommendations for holistic management of the disease in young populations. An update in 2016 added a new clinical recommendation to the guidelines, but no further exploration of the psychosocial aspects of the impact of the disease. 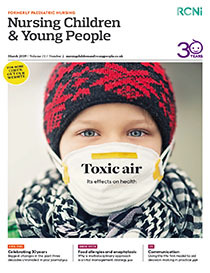 The authors of this article used a critical review of literature and concluded that service provision for adolescents with CD could be made better by improving CD support networks, involving young people in the development of policy centred on their care, as well as incorporating other (non-NICE) well-researched CD guidelines in national policy. These changes would improve quality of life for this vulnerable population.